Around the globe, the Microsoft Surface RT has been the subject of some heavy demand. In the U.S., the entry level $499 tablet had sold out, although the good news is that as of this morning it is back in stock. This option includes the 32GB version of the device, but does not include the Touch Cover which is sold separately for $119.99 and allows touch sensitive typing on a physical (albeit flat) QWERTY keyboard. The Type Cover, at $129.99, offers a more traditional QWERTY keyboard with raised keys. Both covers connect to the tablet via a magnetic dock and double as a protective cover. 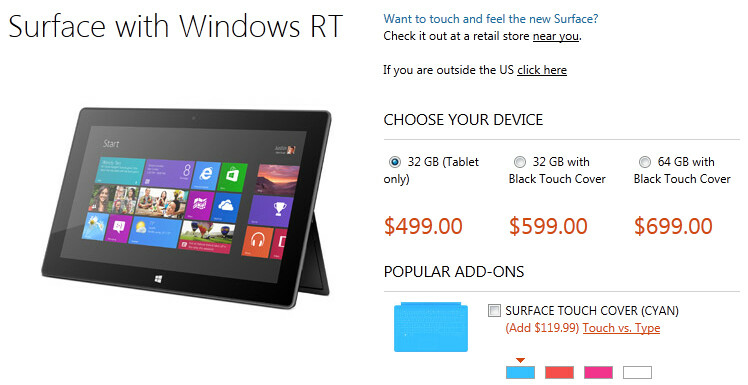 The black Touch Cover is bundled with the 32GB tablet in a $599 option on the website that saves the buyer $19.99. 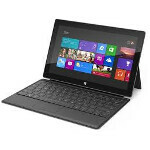 It is also available with the 64GB Microsoft Surface bundled together for $699. Outside of the U.S., demand is just as strong for the Microsoft Surface. For example, in the U.K., only the 64GB model with the black Type Cover is available. In Australia, Germany, France and Canada, the 32GB model without the Touch Cover, equivalent to the $499 model in the U.S., is sold out. Considering that this is the lowest priced option for the Microsoft Surface at Microsoft's online store, we wonder if this is a referendum on the Touch and Type Covers or if it just a matter of buyers trying to save some money for the holiday shopping season. Am in Nigeria and i have been waiting so much for the surface to arrive in my country. i cant wait to have this tablet. its perfect according to adds and review.